According to the 1962 Missal of Bl. John XXIII the Extraordinary Form of the Roman Rite, today is the feast of St. John Mary Vianney and Sts. Cyriac, Largus and Smaragdus. St. Largus and St. Smaragdus are two Roman martyrs. They were buried at first on the Ostian Way. Their bodies were later transferred, after the peace of Constantine, to a church built near the baths of Diocletian by a Christian of the name of Cyriacus. The cult of St. Cyriacus has been joined to that of the two martyrs. 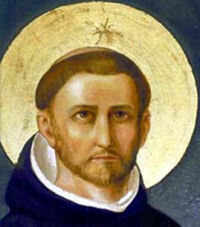 St. Dominic's feast in this rite is celebrated on August 4. St. John Vianney's feast in the Ordinary Form of the Roman Rite is celebrated on August 4.